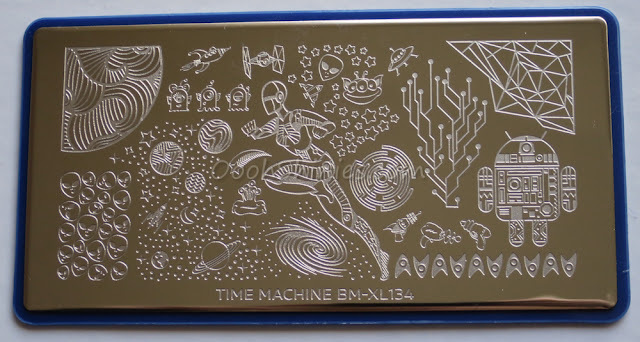 I recently received 2 of the Time Machine plates from Bundle Monster, and I went for a type of nail art that I haven't done before: negative space! I'm still undecided about the negative space nails, sometimes I think they look nice, other times not so much. Either way, it is something different than my usual stuff, that's for sure =) How about you, do you like the peep through nails? And here are 2 plates of the Bundle Monster Time Machine set! The set has 6 plates, all filled with things you could see when using a time machine: from classic cars and a steam locomotive, celtic prints and casette tapes, all the way to the more recent 'keep calm and ..' and moustaches! The plates have matching names as well, they're called Party like 1869, Hipster Qualifications, Pop Culture Addict, Outer Space Cadet, Gilded Revolution and Prehistoria. 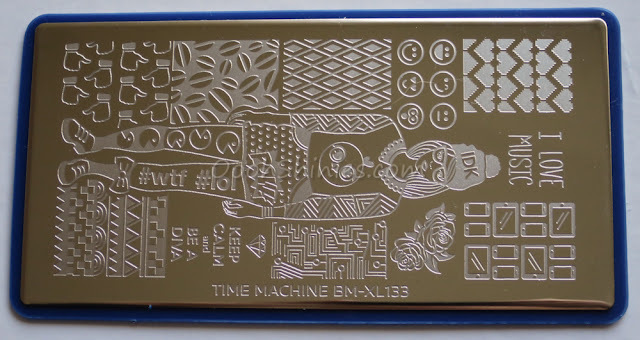 There are plenty full nail images, but as you can see on the plates that I received, these are also great for people that like to fully create their own designs from little bits of images. The plates all have the XL designs (1.5x2.2cm, as you can see on my comparison), and come with a sturdy rubber back and protective blue foil on the front. Needless to say -we're talking about Bundle Monster here afterall- the plates are of excellent quality. The entire plateset is part of the prize of my Bundle Monster giveaway, don't forget to enter :) You can click the images below for an enlargement. I'm loving the bottom left image, as a whole or maybe just a stripe of it? And I think her arms will make for a nice mani too! Imagine one of those as a smaller stripe on the side of your nails. And if you want comic nails, her skirt will do the trick! Easy mode galaxy nails, with that bigger image! Stamp it in white on your galaxy-colored sponged nails, perhaps color in some planets... The top right image can be lovely for reverse stamping (where you color in those areas), but it works nice for a messy, double stamped striped mani too ;) For today's mani I used the top left image. This mani was easy, although I found out that stamping on your bare nails and then using top coat, easily smudges the design. So I redid them with some basecoat underneath (yeah, I'm often a basecoat slacker! ), which worked well. My Konad Black was nearly empty, and Camelot was slightly too sheer, but I'm happy to say that adding some metal balls and a little Camelot to the Konad, solved that issue! A England Camelot with BornPrettyStore studs, and basecoat stamped with Konad Black and Bundle Monster BM-XL134. 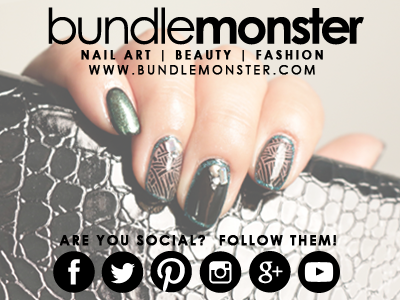 You can find Bundle Monster on the following social media: Facebook - Twitter - Pinterest - Instagram - Google+ - Youtube.